Former Trump Campaign Head Manafort Was Paid Millions By A Putin Ally, AP Says : The Two-Way Ten years ago, Paul Manafort "secretly worked for a Russian oligarch who wanted him to promote Russian interests," the AP's Chad Day tells NPR. Former Donald Trump campaign chairman Paul Manafort, seen here last June, was paid millions of dollars to advance a pro-Russian agenda, the AP reports. 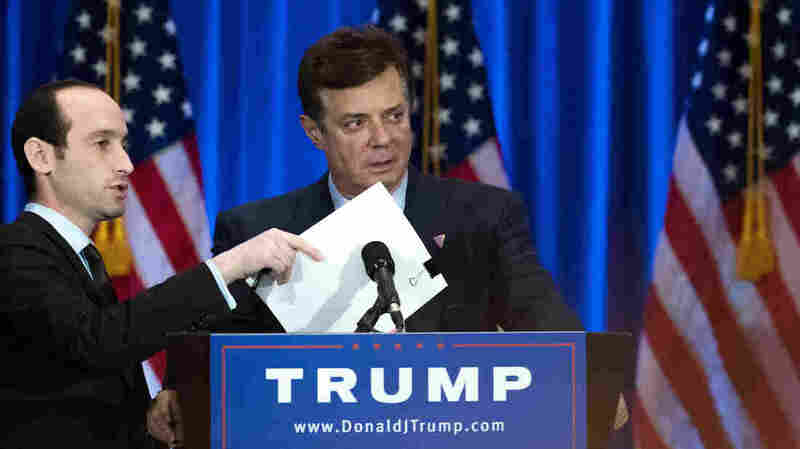 "According to documents that we've reviewed, Paul Manafort secretly worked for a Russian oligarch who wanted him to promote Russian interests," the AP's Chad Day tells NPR's Rachel Martin. "And in particular, he wrote a memo that outlined this kind of vast plan for him to promote Russian interests in the former Soviet republics — and also to specifically benefit the Putin government." The financial arrangement dates to at least 2006, when Manafort signed a $10 million yearly contract with Russian aluminum tycoon Oleg Deripaska, a close Putin ally, Day says. Their business relationship lasted through at least 2009, according to Day's story for the AP. The report of Manafort's pro-Russian work comes days after FBI Director James Comey "confirmed that his agency is investigating possible coordination between the Trump campaign and Russia" in last year's U.S. election, as the Two-Way reported. Investigations are also being pursued in Congress. Earlier this week, White House press secretary Sean Spicer sought to minimize Manafort's involvement with the Trump campaign, saying that Manafort "played a very limited role for a very limited amount of time." Spicer returned to the topic at Wednesday's midday briefing. "Nothing in this morning's report references any actions by the president, the White House, or any Trump administration official," Spicer said. He added, "The report is entirely focused on actions that Paul took a decade ago." As early as last August, reports emerged that Manafort was the subject of a U.S. investigation into his dealings in Ukraine. And in January, The New York Times reported that Trump associates and campaign officials had "repeated contacts with Russian intelligence." In his deal with Deripaska, Manafort promised to counter anti-Russian sentiment, according to Day and his AP colleague Jeff Horwitz. Citing a strategy memo from 2005, they say Manafort told Deripaska that he would advocate a pro-Russian agenda both in former republics and "at the highest levels of the U.S. government — the White House, Capitol Hill and the State Department." In response to their report, Day and Horwitz quote a statement from Manafort in which he confirmed that he worked for Deripaska — but he also said that characterizing the work as "inappropriate or nefarious" amounted to a "smear campaign." "My work for Mr. Deripaska did not involve representing Russia's political interests," Manafort told the AP, saying that he instead focused on representing Deripaska in countries where he had investments. Discussing Deripaska's ties to Putin, Day cites WikiLeaks cables that showed U.S. officials referring to Deripaska as "one of the top two or three oligarchs that are very close to him." Manafort has an apartment at Trump Tower in New York and is a veteran of politics and lobbying; his career stretches back to Gerald Ford and Ronald Reagan. His lobbying firm has been known for working on behalf of "unsavory governments in Nigeria and Kenya, the UNITA rebels in Angola and a group with ties to Philippines dictator Ferdinand Marcos," as NPR reported last summer. Initially hired last March as the Trump campaign's Republican convention manager, Manafort rose to the role of campaign chairman. He resigned in August, shortly after news reports that he had been paid $12.7 million by the political party of Ukraine's former pro-Russian president, Viktor Yanukovych, between 2007 and 2012. "Manafort's consulting work in Ukraine was already under a microscope, given Trump's favorable comments about Russian President Vladimir Putin, an ally of Yanukovych's. Trump raised eyebrows last month when he said he would consider recognizing Russia's annexation of Crimea. Russia invaded the Ukrainian territory in 2014 after Yanukovych was ousted in a pro-Western revolt. "The Trump campaign also worked to weaken language in the GOP platform on aid to Ukraine's post-Yanukovych government. At the campaign's urging, platform language calling for the U.S. to provide 'lethal defensive weapons' to Ukraine was watered down to 'appropriate assistance.' "
Many of the records that snarled Manafort in recent months emerged from Ukraine's new anti-corruption bureau. In this case, Day says his reporting "is not just based on anonymous sources. ... The bedrock of this story is based on documents that we've authenticated, and documents that have been corroborated through sources."